A profession: fine glazed and reinforced metalwork. Metal Quartz employs around thirty people on its site of 3,400 m² in Péruwelz. Technical skills, innovation, rigorous selection of raw materials and permanent quality control allow Metal Quartz to produce high-quality products to guarantee your security. Metal Quartz has developed a reputation and specific expertise in first-rate physical security. 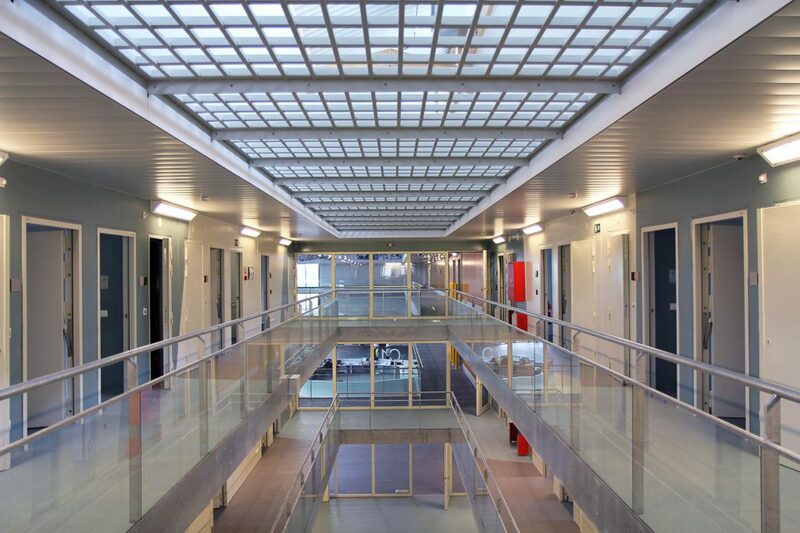 Metal Quartz notably takes part in the securing of Belgian prison outdoor joinery (grilles, barred windows, security bars, prison doors, doors with grilles, etc.). Metal Quartz has developed, tested and certified a range of new products that meet the Ministry of the Interior’s new security standards. Thanks to a proactive design office that listens to the needs of the market, Metal Quartz is capable of developing new products in very short time frames and with an unrivalled level of quality, as demonstrated by a large number of certifications and licenses. We can have the resistance of any security products developed tested and validated by recognised agencies. One of the main approaches is to produce as efficiently as possible: to improve the efficiency of manufacturing operations, reduce the costs of production and logistics processes, scrap operations without added value, reduce malfunctioning and waste (optimise production resources, reduce time and work expenses and produce what is strictly necessary just in time). No water consumption is necessary. There are no specific CO2 emissions other than the ‘classic’ consumption (electrical supply and welding appliances). So as not to affect the environment, 225 photovoltaic solar panels have been installed on the roofs of the offices and production workshops. These annually produce 55,125 kWh which makes it possible to ecologically and responsibly supply 2/3 of the total electricity consumption.